YCS Pasadena Top 4 Duelists! 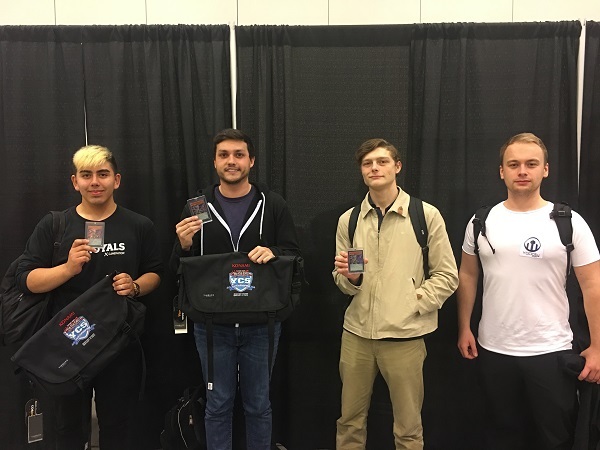 Congratulations to the Top 4 Duelists at YCS Pasadena! Shunping Xu from Philadelphia, Pennsylvania is Dueling against European Duelist Adrian Koch from Germany in our Top 4 Feature Match! Both of these Duelists are using strategies that were very popular in this weekend’s tournament, with Xu piloting a Sky Striker Deck and Koch piloting Goukis. This matchup has become a popular one in the current Advanced Format, due to the immense power of each of the two Decks. But after this Match is finished, only one of these two Duelists will be able to take his Deck to the Finals. It’s time to Duel! The Top 4 of YCS Pasadena is about to start! Who will make it to the finals? YCS Sao Paulo Top 4 Duelists and Dragon Duel Champion! Congratulations to the Top 4 Duelists and the Dragon Duel Champion of YCS Sao Paulo! Welcome to the Semi-Finals! The largest Yu-Gi-Oh! TRADING CARD GAME tournament in South American history is down to just 4 Duelists! Henrique Domingues Nascimento has made it here with Trickstar while his opponent, Caio Martins Gonzaga is here with Sky Striker. It’s a very familiar matchup but the stakes are high! One of these Duelists will be going to the Finals! Who will it be? It’s time to Duel! Congratulations to the Top 4 of YCS Niagara Falls! Four different Decks are currently left in the tournament: Goukis, Paleozoic Frogs, Dark World Danger! FTK, and Thunder Dragons. In a moment, Thunder Dragons or Dark World Danger! will no longer be in the running. Illinois’ Dirk Wagner is facing off against Britain’s Jake Quinsee, and only one of these stellar Duelists will make it to the Finals. Here are the Top 4 Dragon Duelists from Sunday’s Dragon Duel Tournament! Take a look at the Top 4 Dragon Duelists from Saturday’s Dragon Duel Tournament! Congratulations to the Top 4 Dragon Duelists! Only four Duelists remain! Here are the semifinal matchups.